We know what you're thinking. A used Alfa for less than £5000. Have we lost the plot? Well rewind a second because despite the old preconceptions about Alfa Romeo build quality, the modern cars from the famous Italian brand are proving much more reliable. And just look at it. It may not be finished in the classic Rosso red, but it's still a thing of beauty, even in a rather more understated silver. With those classic three ringed headlights, the number plate in a funny place on one side and the instantly recognisable grille - you would never mistake this for anything other than an Alfa Romeo. But it's the rear end that looks superb. With that big clam shell-esque tailgate, rear lights that look look a furrowed brow and quad exhausts, it's an Italian coupe that you never tire of looking at. Oh and ignore the optimistic £5495 in the windscreen, we found this in the classifieds with the price dropped to a much more realistic £4790. 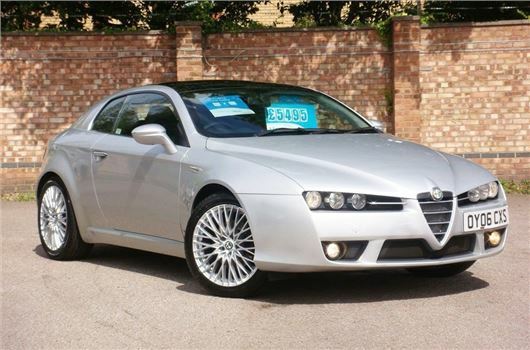 That's a decent price for a 2006 Brera powered by the 2.2 JTS engine and with 88,000 miles on the clock. We did see one or two examples with lower miles, but this car looks better cared for both inside and out. We were very tempted by a 3.2 JTS Q4 we spotted. The V6 engine sounds gorgeous but it's also thirsty. Real MPG shows owners are only getting 21.2mpg. We like the 3.2-litre, but not that much. It may not sound as good as the V6, but the 2.2 JTS still has more than enough power with 185PS. That's good enough for a 0-62mph time of 8.6 seconds and the engine is happy to be revved. The official economy figures state it should be returning around 30mpg but owners in Real MPG are only seeing 25mpg. It's slightly better than the 3.2 V6 but not by much. This isn't a car you'll want to be doing big miles in then. Being an Alfa there will always be a question mark over longevity. Whether the brand will ever be able to shake off the unreliable tag remains to be seen. But we've had very few reports of problems with the Brera. That my of course be because there are relatively few around. Certainly we've been told of more issues with the 159, although many of those are regarding the 1.9 JTDM engine which isn't fitted to the Brera. If you want a diesel there's only the larger 2.4 JTDM available. One issue we've come across with the 159 is corrosion. The paint applied at the factory is poor and some 159s are now failing the MOT due to excessive corrosion in the front subframe. The underseal applied to the floorpans seems hit and miss too and some cars are starting to show the beginnings of rust. It's worth getting your hands dirty and checking underneath the Brera. Better still, get it up on a ramp and have a proper inspection. We've had first hand experience of the gear linkage popping off under hard acceleration (although that was a one off) and you'll want to check the service history properly. The 2.2 JTS has a 20k mile service interval but an oil change every 10k miles is preferable to prevent a sludge build up which can hamper proper lubrication of the timing chain. There are a few other quirks with the Brera too. The driving position is odd and taller drivers may find it takes ages to get comfortable. The gear change is a little spongy and those rear 'seats' are only really good for chucking a bag in. Plus the boot is an odd shape. A case of form over function? Perhaps but we can forgive that when the car looks as good as the Brera. Besides, who buys a coupe for practicality. The example we found looks in very good nick and also has a panoramic glass roof - usefully it comes with an electric blind for when it gets too bright. There looks to be hardly any wear inside with unmarked leather seats. The 18-inch alloy wheels look remarkably non-kerbed too. We know many people will tell you to steer clear of an Alfa, especially a used one, but we think there's plenty to like about the Brera. If you service and maintain it regularly, it should prove an enjoyable and reliable coupe. And one that's guaranteed to always have style and panache.